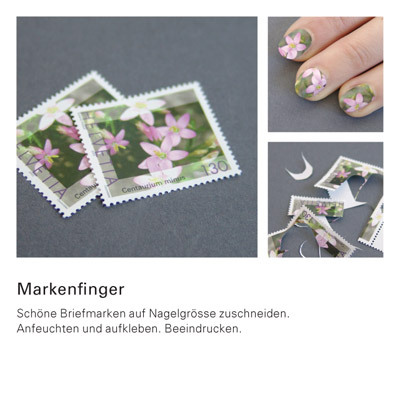 Did you know that you could use postage stamps in a unique way to decorate your finger nails? Here are the pictures from a Swiss-German site Atelier-v.ch, which demonstrates this. Nail art is a very specialized cosmetic field. Nail lacquering, nail painting, nail decoration and nail piercing are some different nail art ideas, which are popular all over the world. Nail art was popular in ancient India in the form of henna painting and application of fragrances. Nail art is a creative field and the fashioning and designing of nails is becoming more and more innovative. 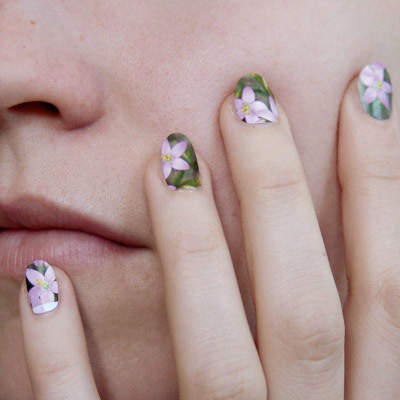 Various mediums like dried flowers, beads and fabrics can be used to enhance the beauty of nails.